bookitLive has a number of features that allows to block out time for when you are unavailable. We understand that nobody is available all the time and needs to close off timeslots in a day, whole days or date ranges. 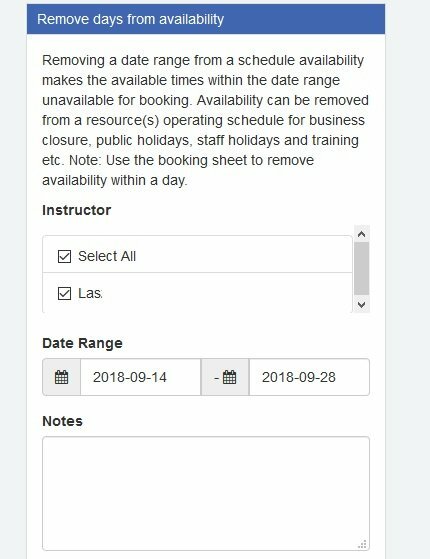 bookitLive allows you to define the day or range of days as being unavailable for bookings, for one of more members of your team or for the entire business. Useful for managing situations such as employee leave, training or public holidays. Any timeslot within your or operating schedule can be blocked out to stop the timeslot from being available to be booked by customers. Adding a break time to your services cater for businesses that require time between services. Such as: a mobile business needs to allow for travel time between jobs, a therapist needs cleanup and setup time between appointments.